I don't expect this to do that well but it's my personal favorite from July so I'm sharing it here. Amazing capture that keeps your attention. Terribly underrated. This is a genius photograph - totally inspired. I would love to see this in a giant format on a wall. Very arty. I always like your stuff. this is great. Jeez, I couldn't figure out which end was up(not that that matters) but when I read the tile....ahaaaa. Really cool. Did you dig Paris, or what? Fine work indeed - thank you very much for sharing it! I hope you're getting a huge score with this one. I love this photo. I hope it is not under appreciated by voters, but I am afraid it might be. Awesome - I love how you have incorporated the reflections into the photo. I had to sit and stare at this for a moment to see what was going on. Excellent! This is pretty cool...took a little bit of study to get a better grasp at exactly what I was looking at. Does look a bit like a dream...well done! I like this abstract a lot. It's a bit hard to interpret, which is part of its attraction. Well done!!! I'd love to know where this building is. Once I saw and understood that I was looking at an escalator, it all made sense. 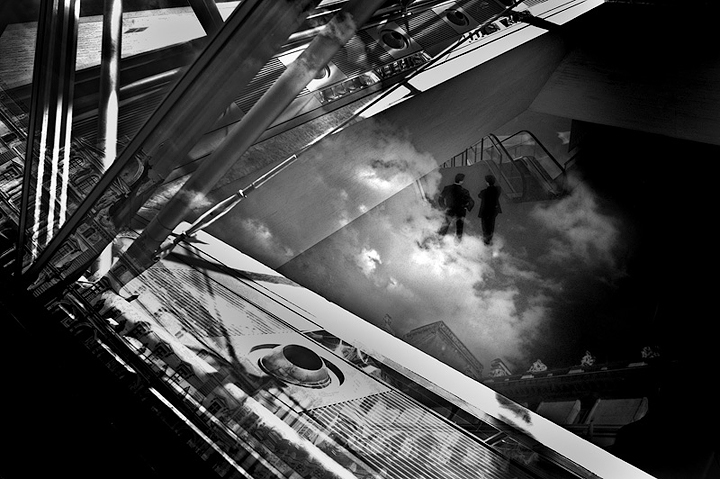 The two people are under a large window on a floor near the escalator, the rest of the hardware and the reflection of clouds is outside of the glass. Really weird angle, I'm still trying to figure out where the clouds came from. Neat shot. I like the black & white "grittiness" of your image. It reminds me of a still image from some old spy movie. Terrific perspective. Like they are walking on clouds. Great tonal range too. This is very cool. standing on the clouds. this is fantastic! Proudly hosted by Sargasso Networks. Current Server Time: 04/20/2019 06:43:52 PM EDT.